Everyone has a leadership style and qualities to go with it, learn how you can improve yours here:Tweet This! People notice a change and the steps you take to better yourself as a leader in the workplace will make an impact on the overall culture and dynamic in your office. Change doesn’t happen overnight, but these simple ways to be a better leader will help you along the way. Before you can get respect, you have to give respect. The best way to get respect is to listen to those around you. If you’re not listening, you’ll never hear how you can improve your leadership style. If you ignore your co-workers for too long, they’ll stop trying to give you feedback. Don’t just listen, actively engage and reflect on what they are trying to tell you. Repeat words and phrases to let them know you’re listening. If an employee or peer tells you they aren’t happy with something, do something to change it. It’s one thing to nod and tell them you’re hearing them - it’s another to act on their criticism. You might not like what they have to say, but they’re saying it for a reason and purpose. Don’t judge them for what they’re telling you. New ideas are good! Summarize, clarify and share those ideas with the rest of the team. The first idea might not be the one you go with, but it gets the ball rolling for other ideas. A coach is only as good as their team. If a team can’t work together, it makes the coach’s job ten times harder. Your job as a leader in your company is like being a coach to a baseball team. You don’t see coaches sitting on the bench at practice, they’re throwing the ball to help their team get better. It’s not until the playoffs that the coach sits in the dugout to watch their team win the title. As a leader, it’s your job to coach your team throughout the day-to-day grind in the office. And it’s your job to sit back and watch your team make the pitch and close the deal at the end of the day. If you help your team in the office, they’ll have the tools to do great things because of the leadership you’ve shown. Your leadership success is based on the results you put out. As a leader, you have a never-ending pile of projects flooding your inbox and sitting on your desk and it’s important to remember one person cannot do everything. Delegating and having the assertiveness to drive results is what makes a good leader great. Most likely, you’re not going to get through that pile by yourself. But, you have a whole team behind you ready to help you get the best possible result. Hold people accountable for their actions. If you assign something and they don’t get it done, that’s on them and you should be able to communicate and give the proper feedback to make changes in the future. You can’t hold your team's hand through every hiccup and bump in the road they come across. If you notice a department falling behind because of technical error or a client not responding in a timely manner, see if they can figure out a solution to the problem. They might even find a better solution or different contacts you can use in the future. Giving direct reports autonomy and control over their responsibilities is one of the best tactics to securing success as well as employee engagement. It’s your job to coach your team through the day-to-day grind in the office. And it’s your job to sit back and watch your team make the pitch and close the deal at the end of the day.Tweet This! But don’t let them struggle for too long. Making sure they know they can do things by themselves is important, but it’s equally important they know you’re there to help them if they need it. As Millennials take over the workforce, they want an open environment where they feel they can ask questions if needed. This is a change from the past when your boss didn’t want to be disturbed unless necessary. As a leader in this new era, you have to make sure you’re fostering an environment where people feel it’s ok to get to know you and to ask questions and have a conversation. Collaborating with you and other employees will help make sure everyone knows what the person next to them is supposed to do and will make it easier for everyone to help with tasks and come up with solutions together. There’s always someone better than you and always someone for you to look up to and learn from. Olympic coaches didn’t get to where they are by staying in one place or not attending conferences to learn from those better than them. Being a leader is all about getting better to help your team get better. Having a coach or mentor from a different company, or someone within your company, will give you ideas for team building and overall make you a better leader. A leadership style you’ve never thought of could be working well in another department or company and the only way for you to learn about it is to seek out those coaches, mentors and leaders. Being a leader doesn't mean you have to have a team of people. Everyone can become a self leader. Leadership is about influencing people not the hierarchy, and anyone can be a great leader if they put the work in. Improving your skills to be the best leader you can be will ensure your team continues to see you as a coach, teammate and someone who makes the company culture better. Is your company struggling to create great leaders to progress the organization forward? 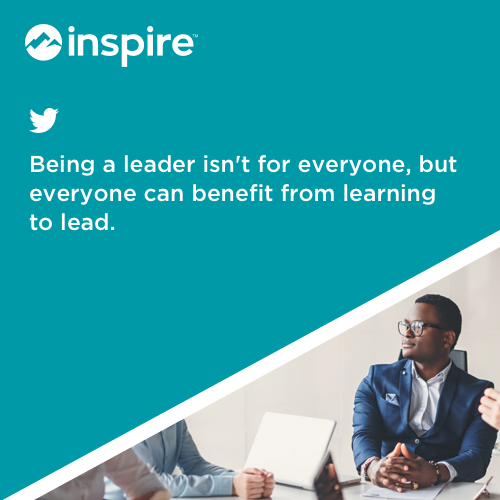 Learn how Inspire Software can help you customize your leadership program and so much more.